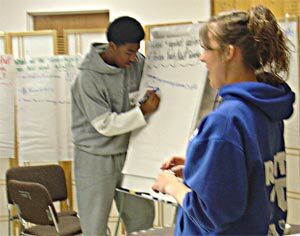 Youth learn about making effective land-use decisions in their communities while addressing important subjects such as social studies, civics, geography, environmental science, land-use planning and land-use technology. Ever wonder why cities are built in certain ways? In order to make a long-term impact on land use, today’s youth and tomorrow’s leaders must be equipped with effective land-use decision-making tools. The Junior Citizen Planner (JCP) programis a series of innovative curricula that educates youth in 3rd to 8th grades on land use issues through fun, hands-on learning activities within their communities. It was developed through a joint effort between MSU Extension’s Citizen Planner Program and 4-H Youth Development. It is modeled after the successful, adult Citizen Planner program. The Junior Citizen Planner curriculum utilizes group activities. These activities can be conducted within several settings including: school classrooms, 4-H Clubs, after-school programs, home schools, Scouts, Campfire, or day and summer camps. Flexibility is a key component of this program. Activities are posted in PDF format under the “Resources” section at the bottom of this page. The activities have been certified to meet both, the Michigan Curriculum Framework Content Standards and Benchmarks, as well as the Kent County Core Curriculum for 3rd - 5th grades, however, the activities are appropriate for participants up to age 13 (8th grade). The activities are not specific to Kent County, they are relevant on a statewide basis. Fun and creative teaching strategies and learning methods, including experiential and hands-on components. Easy to follow materials and flexible lesson plans. Activities / lesson plans meet the Michigan standards and benchmarks and are listed by their numerical code and written out completely. An unbiased introduction to controversial land use issues, presenting all sides of an issue in a fair and honest manner. Activities that build knowledge and skills for inquiry, investigation, analysis, decision-making and action. Projects that can be displayed at fairs, in a class celebration or for guest speakers. Evaluation strategies directed toward a variety of learning styles that assess student learning. Adaptation ideas and technology extensions on activities to further student understanding and investigation. Background information, additional data, facts resources and reference material for each lesson plan.